As I have gotten older though, I have started going through a delightful process of the slow dissolution of my “identity.” I used to be so rigid about not doing things that were out of character. I wouldn’t listen to music outside my genres. I would only drink beers that fit with my self-image or frequent drinking establishments where I approved of their vision. Nowadays, I tend to be more flexible about what do. I think part of it is that the number of roles I play in my life has accumulated. When I am at work, I’m a professional; when I am at home, I’m a goofy dad; when I’m out with my friends, I’m a troublemaker. As I gained confidence in each of these identities, I increasingly mix-and-matched aspects of each persona depending on the situation that I am in. Contrast this to school, where there is no real expectation that you have a life out of school, and the gossip-oriented culture means it is notable any time someone acts out of character. This means identity protection, both from internal and external threats, is a major priority. As we grow into the world, the need for such careful management thankfully fades. Yeah, a big part of becoming a reasonable adult is learning to accept that most of what we think of as “identity” while we are growing up is just a label. When you tie too much of your ego to your “identity,” it can lead to really destructive behavior and attitudes. When you get people who tie their self-worth to an archaic concept of gender, you get Men’s Rights Activists. When you get people who tie their identity to their hobbies, you get toxic fan cultures. When you cede your own personal morals and ethics to a dogmatic text, you lose the ability to decide right and wrong for yourself. Labels and external validation are a handy starting point, but that sort of “identity” doesn’t give us the tools we need to adapt and make decisions in the adult world, which is much less insular than high school. You can’t just live in a bubble anymore. Trying to maintain that sort of insularity as an adult is more akin to a bloody border conflict; it’s bad for the rest of the world, and it’s bad for yourself. Then, the gameplay is like a more active version of Phoenix Wright. I love when a mystery game lets you play out the solving of the murder, and Danganronpa‘s is especially fun. You rarely have all of the information (the other students like to interfere and sometimes there were rooms you couldn’t investigate before you’re forced into the trial). 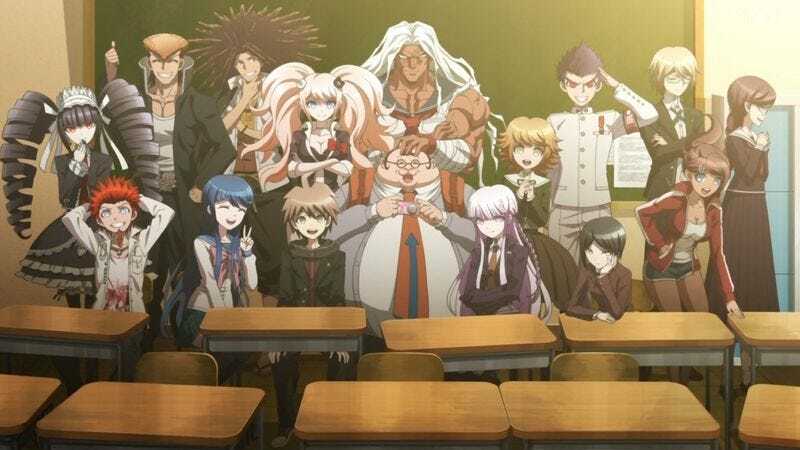 So when it comes to the class trial, you have to fight all of these absurd personalities to find out who the culprit is. The one downside is that it has the same problem Phoenix Wright always has. “I have two items that work equally well to reach this solution, but the game wants only the one it thinks is right.” That can get frustrating. I call it the “Shoelace Tying Lesson” problem. From the core details of your investigation, you intuit who-dun-it or what’s going on, but you need to know the step-by-step triggers the game requires before it can acknowledge your character knows what happened. So you have to teach the game/main character how to tie the plot’s shoelaces step by step and reverse engineer the process. “I know the killer used the knife here and hid it behind a bush, but first I have to have the main character argue about the bush, then figure out the blade was hidden from view, then figure out the bush had a branch missing after the blade was hidden. Once all that’s done, the game will trigger the sequence where my character figures out what I already know.” So as Corfish says, when you come across two items that could lead to the same inference about the current scenario, you’re hard pressed to know what the developers decided was the paramount clue. It doesn’t happen too often in Danganronpa, thankfully. It’s like showing your work in math class, except (mostly) fun because it’s a murder mystery! Shadow Of The Beast raises the question: What games’ popularity, in retrospect, might have been boosted by the state of the hardware market at the time? Much ballyhooed launch titles boosted by excitement over new technology and are now forgotten? Vanguards of the console wars that were once held over your friends’ heads as examples of the superiority of your console, which you realize now were pretty awful? Three come to mind for me: Altered Beast for Genesis, and Syphon Filter and Fear Effect for PlayStation 1. Having reviewed the comprehensive Wikipedia list of launch games, I’ve got a couple. Twilight Princess was an excellent GameCube game, but a mediocre Wii launch title. It was effectively identical but had inferior tacked-on motion controls. Additionally, Turok is a game that was interesting at the time of its Nintendo 64 launch in 1997, but it has not aged well. Perhaps more fascinating is that this Wikipedia list is generally comprised of games that either remained relevant (Super Mario 64, Halo, etc. ), games that were clearly mediocre at the time of release (Perfect Dark: Zero, Eternal Ring, etc. ), or games that are entirely forgotten (Giromite, Total Eclipse Turbo, etc.). I may be crucified for this, but maybe Crash Bandicoot? Perhaps I’m being unfair here—I’m basing this mostly on playing the first level a few days ago in SPOILER SPOILER SPOILER Uncharted 4 (I did play the original, but that was almost 20 years ago). I have a hard time believing the controls and level design were anything but kind of terrible. It certainly was cool having something that at least seemed 3D, and that made for one hell of a pair of rose-colored glasses. I’d submit The Bouncer for PlayStation 2. I remember being excited by the shiny new graphics, not just in the cutscenes but in the gameplay videos as well. It felt like a huge step up from PS1-era visuals, and we rented it the same weekend we picked up the PS2. I think we also harbored the expectation that The Bouncer being developed by Squaresoft meant it would share some DNA with the Final Fantasy series. It turns out that shared DNA was only superficial (the protagonist looks like he was a pre-Disneyfied dry run for a design that would eventually become Sora in Kingdom Hearts), and a weekend was all we needed with it. After the excitement over all the prettiness had worn off, we were left with a repetitive beat-em-up—room after room of punching dudes until they didn’t get up anymore. Then you’d punch a dude who looked different from the other dudes. We realized that we’d played a better take on this kind of game a million times in arcades, and didn’t bother buying it. That does it for this week, Gameologerinos. Thank you for reading and commenting. We’ll see you next week!